Sao Paulo: Allianz buys fifth stadium name, what will it be? This stadium isn’t built for the 2014 World Cup. It’s built only for money – the goal is clear and Sao Paulo, one of the world’s largest cities, currently booming, seems to be the perfect place for American AEG to find a lucrative event venue. And to make the investment feasible, a solid naming rights partner was needed from the start. Just as predicted some time ago, it’s Allianz. The German insurance giant, who was denied the purchase of world’s most expensive stadium’s name presumably for its connections to Nazis, will hold the name of Arena Palestra Italia for 20 years, almost all of the expected lifespan. This is Allianz’s fifth sports stadium name after Allianz Arena (Munich), Allianz Stadium (Sydney), Allianz Riviera (Nice) and Allianz Park (London, rugby stadium). Still open is the final name of Sao Paulo’s new stadium. Investor, contractor and sponsor are giving Palmeiras fans the chance to make their voice heard in an online survey, which will be taken into account during final selection. 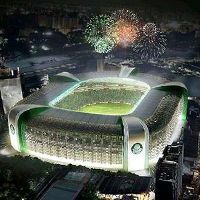 However, there are only three names to choose from – Allianz Parque, Allianz Center and Allianz 360. Which would you choose? Everyone can take part in the survey through official stadium page or facebook application, so feel free to make your opinion count.